Giant reed Arundo donax, photographed by Russ Kleinman & Richard Felger. The grasses are without a doubt one of the most successful groups of plants in the modern environment. So it is only fitting that for today's post I'm going to be looking at one of the subgroups of the grasses, the Arundinoideae. The Arundinoideae, including the reeds and related species, has been long recognised as a subfamily of grasses, but rather vaguely so. Most of the characters of leaf anatomy previously used to define the group are either plesiomorphies or absences. Arundinoids use the plesiomorphic C3 photosynthetic pathway rather than the derived C4 pathway and lack the radiate leaf anatomy associated with C4 photosynthesis. They also lack the fusoid leaf cells with accessory arm cells that are characteristic of the bamboos. In other features, 'arundinoids' were quite variable, and it therefore came as no surprise to anyone when phylogenetic analyses indicated that the group was polyphyletic. As a result, the Grass Phylogeny Working Group (2001) divided the arundinoids between a number of subfamilies, separating the wiregrasses as the Aristidoideae and the oatgrasses and pampas grasses as the Danthonioideae. This reduced the Arundinoideae proper, previously including well over 600 species, to less than 40. Common reed Phragmites australis, from here. Even so, the arundinoids remain a disparate group, and morphological synapomorphies of the group remain elusive. The taxonomic core of the group, the reeds of the genera Arundo, Phragmites and Molinia, are connected by the possession of hollow culm internodes, a punctiform hilum (the detachment scar on the 'seed') and convex adaxial rib sides in the leaf blade (Grass Phylogeny Working Group 2001), but these features are not shared by all other arundinoids. 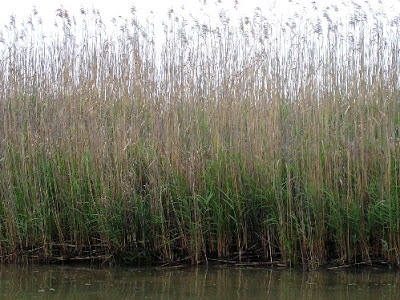 The reeds are found in damp habitats, and the common reed Phragmites australis can grow in standing water. The largest species, the giant reed Arundo donax, can reach a height of ten metres under ideal growth conditions. 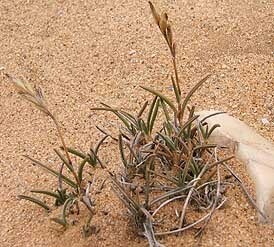 In contrast, the Tom Thumb grass Dregeochloa pumila is found in the Namib Desert of South Africa and Namibia, and doesn't reach any higher than 25 mm (excluding the flower stalk, which may give it another inch or so). Dregechloa pumila is also remarkable as the only succulent species of grass. Also included in the Arundinoideae are the crinipoid grasses, a somewhat poorly known assemblage of species found in highlands of Africa, Madagascar and southern India (Linder et al. 1997). Tom Thumb grass Dregechloa pumila, from Ernst van Jaarsveld. Arundo donax has become known in some areas as an agressive weed, particularly in the US. It has one of the fastest growth rates of any plant, potentially up to ten centimetres in a single day (remember, that's four Dregeochloas!) Despite its invasive potential, some have been promoting it as a potential crop species, particularly for the biofuel market (presenting its fast growth rate as an outright advantage). 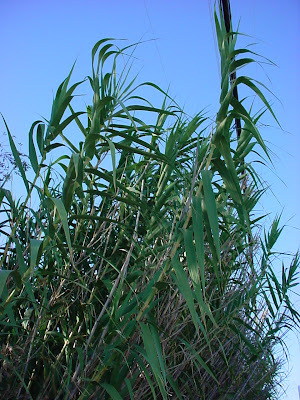 Arundo donax is also the preferred material for woodwind reeds. Phragmites australis (also a problematic weed in the wrong circumstances) has been used in wastewater purification, and Wikipedia also notes that it is edible, quoting that the young stems "while still green and fleshy, can be dried and pounded into a fine powder, which when moistened is roasted like marshmallows". 'Like' marshmallows, perhaps, but I don't think that I'll be rushing to make the substitution. Grass Phylogeny Working Group. 2001. Phylogeny and subfamilial classification of the grasses (Poaceae). Annals of the Missouri Botanical Garden 88 (3): 373-457. Linder, H. P., G. A. Verboom & N. P. Barker. 1997. Phylogeny and evolution in the Crinipes group of grasses (Arundinoideae: Poaceae). Kew Bulletin 52 (1): 91-110.